Free Shipping Included! 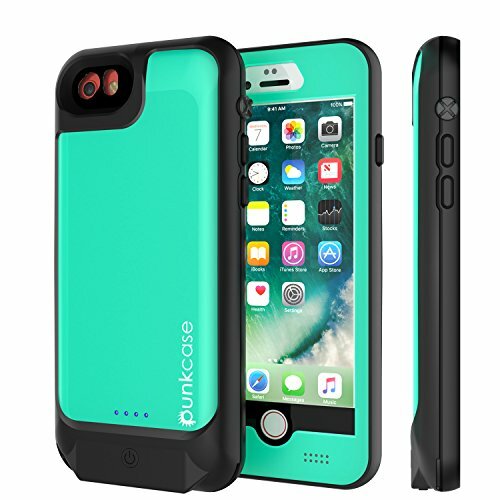 Punkjuice iPhone 8/7/6s/6 Battery Case - Waterproof Slim Portable Power Juice Bank W/ 3000mAh High Capacity - Fastcharging - 120% Extra Battery Life for Apple iPhone 6/6s/7/8 (Teal) by punkcase at All Company Mobiles. Hurry! Limited time offer. Offer valid only while supplies last. ✅ PUNKJUICE YOUR iPHONE 8/7/6s/6: Never again get punked by a dead battery! Waterproof, dirt proof, drop proof and snow proof plus a SLIM & SLEEK DESIGN that perfectly follows iPhone's precision lines make Punkjuice THE ULTIMATE POWER CASE. ✅ 3000mAh HIGH CAPACITY BATTERY: Spend more time camping in the woods instead of a power outlet. Powered by an integrated 3000mAh battery that extends your battery life more than twice. Rapid Charge Technology ensures SUPER FAST RECHARGING. Auto Stop charging function once your phone is at 100%. ✅ LOCK OUT THE ELEMENTS NOT THE INPUT: Perfectly fitted outputs allow effortless access to your charging port, headphone jack and all other controls. And best of all - the BUILT-IN SCRATCH PROTECTOR is fully functional with the iPhone finger scanner. ✅ PLEASE NOTE: PunkJuice has been designed for the iPHONE 8/7/6/6S ONLY! Not compatible with other devices. Also not compatible with the majority of non-Apple branded USB cables. ✅ 36-MONTHS EXCHANGE WARRANTY: If you are not entirely satisfied with your Punkjuice case simply contact us and we gladly resolve any issue you may have. Customer Satisfaction is our #1 Priority - that's the Punkcase Guarantee! If you have any questions about this product by punkcase, contact us by completing and submitting the form below. If you are looking for a specif part number, please include it with your message.